Passengers flying in and out of Stansted Airport will be able to take advantage of up to an hour of free Wi-Fi following a move from the Essex-based airport's new owners, Manchester Airports Group. 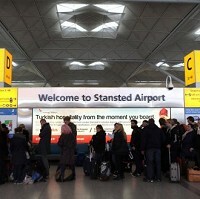 Smartphone, laptop and tablet device users will be able to tap into the '_stanstedairport' wireless network from the comfort of the departure lounge after it was launched earlier this week, although travel insurance is recommended for those taking expensive equipment overseas. The set-up is capable of recognising and remembering details of previously registered devices, saving the need to re-register with every visit. Neil Banks, Stansted's terminal manager, said: "We live in a modern mobile world where accessing the internet on smartphones, tablets and laptops is now a daily routine. As part of our drive to improve services for passengers we're delighted to offer one hour free Wi-Fi throughout the terminal, enabling customers to get those last-minute emails, conference calls and social media updates done before taking flight."